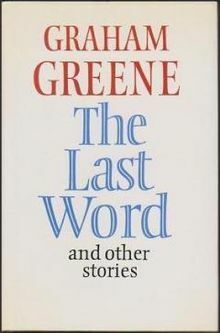 The Last Word by Graham Greene provided me with good company in between naps during my recent bought with the flu. Last week I watched a movie on TCM which originated in one of Greene’s short stories and decided it would be nice to read more of them. I am glad I did! What an amazing writer! I believe I have read books by Greene at some point in time, but this is the first time I remember reading his short stories. This novel is a quick read, but the stories contained in it are priceless, the writing superb. The title story is profoundly moving and I also loved one about a detective about to retire, a man who steals the Eiffel Tower, and another about a man who holds a job where he is forced to eat more than he wishes while keeping restaurant surveillance over suspected spies. I enjoy reading the works of great writers every now and then because they remind me that writing is not as easy as it may seem and provide me with food for inspiration. This entry was posted in Uncategorized and tagged Books, fiction, Graham Greene, short stories, The Last Word. Bookmark the permalink. Any favorite titles? Stellar writing!